I'm sitting here getting ready to get dressed and go execute the weirdest, wildest, most incredible event of my life. I've been married twice and this feels similar to the anticipation of my weddings except that thousands of people didn't buy tickets to my wedding and the national media, for some odd reason, didn't show up. Also, we weren't reliant upon the good will and talents of hundreds of people whom we recruited to help us. By the end of the day, we should have our answer to whether we've raised $100,000 for music education programs in the Clark County public schools. We'll know how successful Erich Bergen has been creatively in writing and directing a show that his mother tells me he's been writing since he was 4. We'll see if, uh, all the volunteers show up. As John Katsilometes wrote in his preview on LasVegasSun.Com, I will write much more about what this has been like in my Weekly column on Thursday and I've been well aware of the complicated journalistic waters I've waded into. But, here I am and I'm determined to make this as successful as possible and also as thrilling and enjoyable as possible. If you don't have tickets yet, some -- albeit the pricier ones -- are still available via Palms.Com. 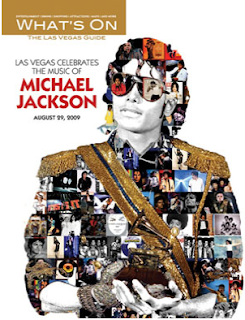 The Cinevegas-partnered "Moonwalker" screening -- after which I am helming a Q-and-A with director Vince Paterson and actress Kelly Parker -- is sold out, but a second screening without the Q-and-A has been scheduled for 10:30 p.m.
...and then if you flip it over, here's the program, which opens from the back. 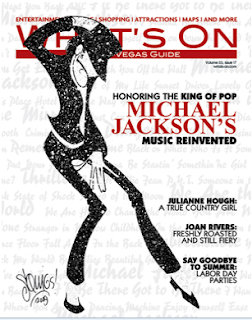 If you can't come, we are selling some collectors items on VegasLovesMJ.Com -- T-shirts, What's On issues, posters -- with all that money, again, going to the Clark County Public Education Foundation. Or you can just donate to help us reach the goal. Any which way. I've been posting photo albums on the Facebook page for the show all week, so go to visit here and check them out. And I'll be Tweeting all afternoon either at @VegasLovesMJ or @TheStripPodcast -- I may switch my phone-based Tweets to the show Twitter feed for today. Haven't decided yet. OK -- must run. Have a little show in the barn to execute. A number of months ago, my Little Brother's mom mentioned to me that she was looking to buy her first house but felt badly that she was going to get a killer deal on the back of someone else's misfortune. It was a fascinating notion, something I termed economic survivor guilt. It's not logical and it's not justified -- it's not her fault someone else lost their home -- but it's a unique experience to move into the living space of other people, a place where drama must have occurred. As is often the case, it launched a story idea. It wasn't easy to pull this one off, though, because real estate agents don't want to help journalists locate people who have any misgivings or hesitations, however founded or unfounded. I did it, though, and this piece in today's USA Today is the result. Take a read. It's obviously focused on Vegas since this is a foreclosure capital -- usually I do broaden these stories to other regions, but this one sat comfortably in one town for the most part -- but I am sure people feel this way in Florida, Detroit and elsewhere. What is a little shocking to me is how angry so many of the USA Today commenters are. Nobody is suggesting that this sense of guilt is appropriate. But it's the human condition, usually, to feel badly for unfortunate others, isn't it? Somehow even with all the MJ tribute craziness, we managed to pull off a pretty good show with the irrepressible Joan Rivers. She's spunky, that one. No time for an AAC edition, though, and I've been advised NOT to split the feed in two, so I may abandon the AAC format so as to not annoy the non-iTunes peeps out there with burdensome extra download material. People really hate that, so I've learned. Anywho, right-click on the date below and save it to your computer. Or you can subscribe (it's free!) via this iTunes link or via this Zune link. She’s been mocked mercilessly for her voice, her red carpet antics and, of course, her plastic surgery. 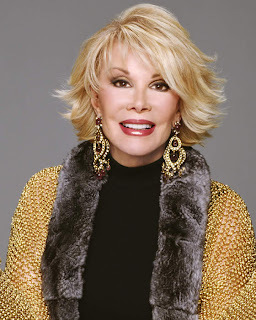 And yet at 76 years old, Joan Rivers is somehow still relevant, with a new show on TV Land called How’d You Get So Rich and stand-up shows this weekend and next at the Venetian. Rivers returns to our version of The Strip, too, to gab about her recent slam on all poker players on The Celebrity Apprentice, about how she’s more famous today than her late nemesis Johnny Carson and about which stars she thinks have – get this – had bad plastic surgery. In Banter: A Strip zip but no Dinner in the Sky?, Hotel 32 thoughts, Top Chef Vegas and more. Read about the prospect of an Excalibur zipline? I am on my laptop on the floor of the Pearl at the Palms observing our rehearsals, dealing with other media -- about to tape a Today Show interview -- and putting out various fires related to the big Michael Jackson tribute benefit concert this Saturday. And then, in this bizarre year of constant celebrity death, we lose another. 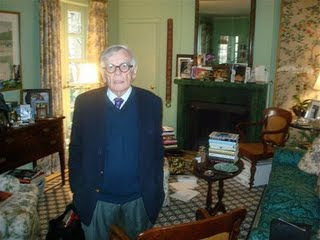 And this time, it's personal: Dominick Dunne. That's me with him above in the fake Palace Station hotel room built in the basement of the courthouse in Las Vegas. It was never used in the trial because the judge decided it wasn't an accurate representation -- she took the jury to the actual room a mile away -- but it amused Dunne and me to no end that the prosecution had built such a silly thing. 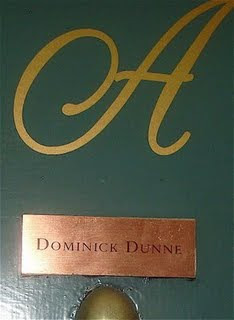 As faithful readers of this blog know, I had the great fortune of being assigned to sit next to Dunne during the O.J. Simpson armed robbery trial last fall. It was one of those serendipitous accidents of fate that have so wonderfully dotted my life. That first trial morning, as I got myself awake, I finished reading Dunne's column in Vanity Fair looking back on his 25 years as a columnist there. The last sentence: "What a swell party it's been. Next, it's off to Las Vegas for O.J. Simpson's trial for armed robbery and kidnapping." I put that down, got dressed, went to the courthouse and an hour later sat down next to...Dunne! I was charmed instantly, as most people were. He was frail, certainly, and he collapsed during the trial at one point. But he was still totally into it and was back in court a few days later, working sources and enjoying being the most famous person, save for Simpson himself, in the room. He took his notes in notebooks that had a cartoon likeness on every page, which I just loved. I so wanted one; never got one. What he wrote wasn't what you might expect. He didn't care about the day's news or even any quotes in the trial, as those of us covering for the next day or the night's news had to. He wrote names, descriptions, analogies. The rest of us were focused on the proceedings; he was fascinated that co-defendant C.J. Stewart's lawyer Brent Bryson had once killed a man in a bar fight. That was a Dunne twist. We bonded instantly, had breakfast a few times during the trial, remained in touch via email and lunched when I was in New York in December. I think I earned his respect in part by my coverage in the Times of the proceedings but also for simple things like picking up that first breakfast at Tableau at Wynn. It puzzled and impressed him and I have a tremendous respect for people of his stature who don't expect freebies even though they probably reasonably can. He also took me to his favorite place in New York, Aretsky's Patroon, his treat this time. The next time I was in NYC, though, he was in Germany undergoing experimental stem cell treatment. He emailed with great optimism about what he was doing to stay alive. What always struck me was that when you were with Dominick Dunne, it was hard to believe all the people this made you one degree of separation from. He knew everyone but he didn't really act like it. After my New York Times Sunday Styles profile of him came out documenting the fact that this was his last trial, he called me and wrote me repeatedly with updates on all the people who had called or written him to say they had seen it. It surprised him that he was prominent and relevant, that the audience of the New York Times would be interested in him. Oh, and it thrilled him, too, because he knew that it would drive Vanity Fair editor Graydon Carter NUTS. He felt Carter had it in for him, that Carter resented having inherited Dunne from prior management. "He's jealous because I'm more famous than he is," Dunne told me once. That said, he loved celebrity and said so openly, as you'll hear on the podcast interview linked at the top. Walking from his apartment to Aretsky's Patroon in New York, people kept saying hello and he was thrilled to greet them all back. It was never a bother, even when he was ill and in a lot of discomfort. 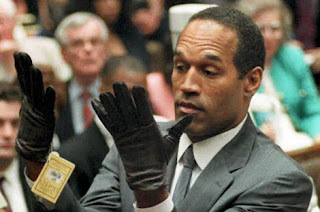 Likewise, he didn't look down on the fascinating world of celebrity crime and, as I wrote in the Las Vegas Weekly, taught me to love my bite of the O.J. apple despite the sneers of journalists who thought they were better than all that. Dunne took great interest in me and what I was writing about even when the OJ trial was over. I found this humbling and shocking; he had a lot of better things to do than care about me. But he liked the mentor role. Dunne's broader fame came from a few important celebrity trials, most specifically O.J. The First and the Claus Von Bulow trial. So when Sunny Von Bulow, the incapacitated heiress, died the same weekend as Simpson was sentenced in December, Dunne seemed a little thrown by what the fates might be telling him. "That they both happened this way the same weekend must mean something," he told me. We didn't specify what, but it was clear the unspoken thought was that it was a way of tying up some loose ends as Dunne's health deteriorated. I had lost my grandmother to bladder cancer in 2003; I suspected he couldn't have long regardless of how he spoke of future plans. And that's one of the shames here. Although he was 83 and had lived a full, rich life, he didn't finish what he had hoped to. He had a novel in progress and planned to write his complete memoir. I'm hopeful there are journals from which it can be constructed. There were so many wonderful stories. That is one book most of New York wants to read. I bet Carter would even print an excerpt in VF. The Strip is LIVE tonight w/Joan Rivers! 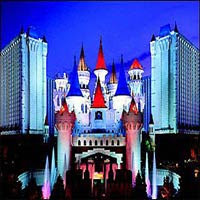 We're live tonight at LVRocks.Com with this week's show as well as the live chat room and webcam. As of right now, Miles expects to make it this week. If he needs to be late, we'll play the interview at the top of the hour. And what an interview it is. Joan Rivers cackling about other people's plastic surgery gone awry and about how negative press has ruined other people's careers? Chutzpah! And there's more, of course. Rivers appears at the Venetian this weekend and next. Join us or wait for the podcast version. Your call! ...and the rest of the collection. That's Mob Law, the documentary about him, and the film Casino, in which he plays himself. Also, there's John L. Smith's biography of him, too. Yep, that's La Toya Jackson. And here's some representation of his love of Bombay Sapphire gin, even though he drank a different gin when I wrote the first national profile of him as a politician for US News & World Report 10 years ago. It's hard to see, but it's a New York Times piece on downtown redevelopment. Guess who wrote it? The mayor will be term-limited out in 2011 and is contemplating a run for governor as an independent. He's also encouraging his wife, Meadows school founder Carolyn Goodman, to run. (See this blog post with pix of the school.) He noted that either way, Carolyn doesn't want him bringing all this stuff home with him when his time is up. He's talking about an auction. I wonder who the highest bidder might be on that framed and mounted newspaper clipping above? Oh, P.S. : He gave me more of his poker chips to give away on "The Strip." The first one lasted in the prize pool all of a week. Details to come. I didn't want this to get buried in the other post about the Bootleg Canyon Flightlines, but during my interview with Ryan Geene, the manager of the attraction, he revealed that Greenheart LLC, which owns it is in negotiations with Excalibur to build one there, too. "We’re trying to see if we do one line, a teaser line, so you fly out and when you get off there’s a kiosk where you can sign up to go do the real deal out in Bootleg Canyon. ... But it would have to be exciting, too. If it's just a slow line, it’s no fun, why would you want to do a boring thing? So it would have to be exciting and leave you wanting more." Geene said they're scoping out places to erect the steel cables, maybe "somewhere above the drawbridge where you walk in so you’re flying over everybody as they’re walking in." He also said they're talking to the Hualapai Indian tribe in northwest Arizona. They're the ones who built the Grand Canyon Skywalk and they're always looking for new things to build to give tourists more to do. Also, because the Hualapai aren't beholden to the environmental regulations on their portion of the Grand Canyon that the US Parks Service are, there's more opportunity to create a zipline across some portion of the big hole. That said, it doesn't strike me that ziplines are all that harsh on the environment but I doubt the U.S. government would permit it given that they reject most everything else including the Skywalk. Anyhow, more of these things are coming. hold what we're attached to. See? Boulder City, as I reported in my New York Times piece earlier this year, is repositioning itself as an outdoor-adventure hub and this attraction from Greenheart LLC part of that. I'm not a person who likes roller coasters or bungee jumps or anything involving being nauseated, so I was very nervous about this until I got in the harness and hung from the line waiting to be launched. It all feels very secure and 10,000 tourists have done it so far without any injury. Bootleg Canyon is so named because bootleggers would distill alcohol for residents of Boulder City, where liquor was still outlawed even after Prohibition ended in the 1930s. Today, it's known as one of the nation's top places to go mountain biking. Here's some of the ramps and stuff they have. The deal with Boulder City was that the city gets $10 from every tourist fee on the zipline. Greenheart also gives $2 to a conservation group that cares for the hills. Greenheart has also build ziplines in Haiti, Canada and San Diego, although none have four runs except the Vegas one. You can visit BCFlightlines.Com for more on how long each line is; I can't recall. Much of that video was shot by the Bootleg Canyon staff. That was something fascinating to me, that they don't try to soak you by taking your $150 a person for the experience and then charge you for pictures and videos and stuff like that. The guides are only too happy to shoot with your camera as many times as you like. I can't recall that kind of customer service at any similar attraction I've done of this ilk. ...and of me taken by him!